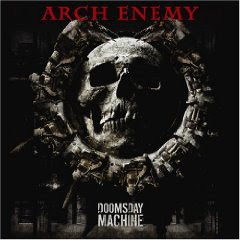 Review: Arch Enemy, "Doomsday Machine"
When Angela Gossow joined Arch Enemy for 2002's "Wages of Sin," she not only kicked down the door for women in the male-dominated extreme metal genres, she stomped it into splinters. This, the band's third album with Gossow on vocals, completes an evolution begun on "Wages of Sin" from a Gothenburg-style death metal band to a melodic metal machine. The only blast-beats to be found are on the mediocre "Out for Blood," and the melodies on songs like "My Apocalypse," "Carry the Cross" and "Mechanic God Creation" are almost hummable. That's sure to make the heavier-than-thou death metal set foam at the mouth and scream "sellout," but it's also sure to open the band up to a wider audience that may not be comfortable exploring the most extreme fringes of the metal genre. The band offers a nod to their influences, including British metal band Diamondhead on "Machtkampf" and Queen on the instrumental "Hybrids of Steel." Brothers Christopher and Michael Amott deliver biting guitar riffs, and the album contains some of drummer Daniel Erlandsson's best work to date, as heard on the first single "Nemesis." Fans of the band's first two albums with vocalist Johan Liiva may not like it, but fans of old-school thrash bands like Metallica and Slayer will want to check this out.